"(aged in a combination of concrete tanks and old foudres and barriques): Brilliant ruby-red. High-pitched, mineral-laced red and dark berry and potpourri scents are complemented by notes of anise and Asian spices. Silky and open-knit on entry, offering sweet raspberry and lavender pastille flavors that tighten up slowly with air and pick up a subtle, exotic blood orange nuance. Shows wonderful clarity and lift on the impressively long finish, which is given shape by silky tannins." 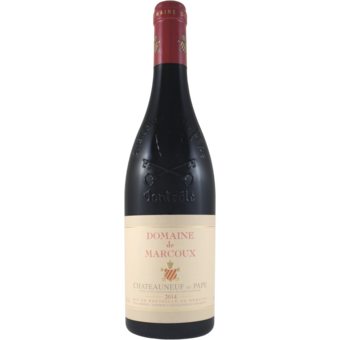 "The classy, elegant 2014 Châteauneuf du Pape has terrific purity as well as medium-bodied richness, loads of strawberry and framboise fruit, flowers and spice aromas and flavors; it has a ready to go, expansive, pleasure bent style. The blend in 2014 is 80% Grenache and 10% each of Syrah and Mourvèdre, aged in a combination of demi-muids, concrete tanks and tronconique tanks. It should drink nicely through 2024." "The Châteauneuf-du-Pape Rouge, the bulk of the production at Domaine de Marcoux, is sourced from 13 sites spread over a wide range of terroirs. This allows for a wine that is both dense but pure and lifted with beguiling aromatics. 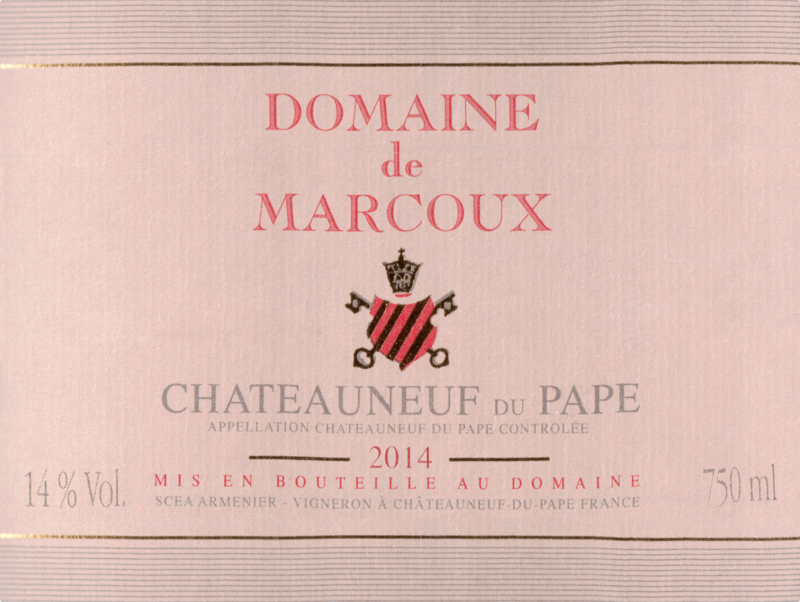 In general terms Marcoux is always inclined towards red-fruit flavors with a smoky stoniness that emerges with age. At almost any visit, in stentorian tones, it is announced that the wine is made in the vineyard. True enough, grapes are a product of land in which they are grown but the very act of viticulture and viniculture is a uniquely a human pursuit. Birds and wild boars also love grapes but you do not see them terracing vineyards or tending vines. An understanding of terroir cannot be complete without including the people who uncover it and nurture it. As important as the various soils of Châteauneuf are to the wines it produces so are the people who make the wines and farm the vineyards. Perhaps no better representatives of this fact are the Armenier sisters, Catherine and Sophie.